Do you know what your plant zone is? Chances are your plant zone isn’t the same as it used to be. 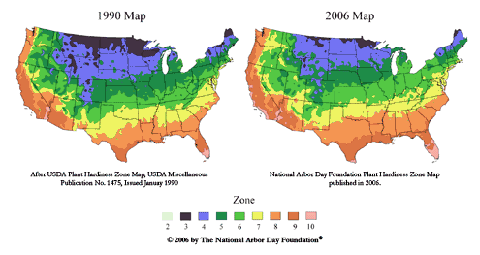 The National Arbor Day Foundation (NADF) updated its hardiness zone map in 2006. Before that, the flower & plant zone map was based on statistics that were over 20 years old. The NADF Hardiness Zone map now reflects a warmer climate and the latest hardiness zones are based on the most current temperature data available. Because of this, gardeners will begin to see a wider selection of plants available to them, while some plants that need the colder temperatures of winter will begin to suffer. Overall, the growing season will be longer throughout much of the U.S. Compare the NADF Hardiness Zone map with the USDA Hardiness Zone map that is based on the lowest temperatures recorded for each of the years 1974 to 1986 in the United States and Canada and 1971 to 1984 in Mexico. Zone 1 (the coldest) represents Alaska and Canada. Most of the United States falls within Zones 2 through 10. Zone 11 (the hottest) represents Hawaii and Mexico. So, which hardiness zone map should you be using? 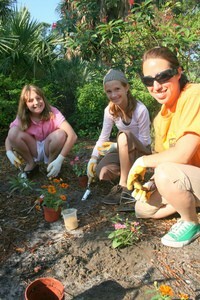 Truth is, hardiness ratings alone are inadequate to guide landscapers in selecting the most successful plants. What Does A Hardiness Zone Map Really Tell You? Another important variable that determines when you should plant is the frost/freeze date for your area. Here’s the frost chart for the United States.